Introducing the only 100% waterproof, high power, binocular with digital Image stabilization. It gives you rock steady images while you're moving on water, land, or through the air. Designed for use in or on: - Power Yachts - Sailboats Sportfisherman - Tugs - Service and Supply Vessels Helicopters - Planes - Patrol Boats - Police Cars Commercial Fishing Boats - Fire Boats - Barges SUVs and just about anything that floats, flies, or rocks and rolls. More than just steadying your hands, TECHNO-STABI stabilizes your world! Features Dual piezo-vibration sensors and gyro position sensors, computer-linked to direct drive motors, help you lock on to subjects - even with both you and the subject in motion. When you`re standing still, on dry ground, holding a conventional 7 or 8 power binocular, studying a stationary object, it`s fairly easy to enjoy a big, steady image. But as binocular magnification increases, the image area shrinks and things as minor as the pulse in your hands are transformed into jumpy, jittery images. Using higher powered binoculars -10, 12 or 14X - literally magnifies the problems with dizzying and fatiguing effects. Tripods can help. Some image stabilizing binoculars help overcome the high power "jitters." Unfortunately, that is just about all they do ... and then, only as long as you`re standing still. On dry ground. When the target moves, when both you and the target are moving and you`re in a speeding boat and getting splashed with salt water, you need the TECHNO-STABI. 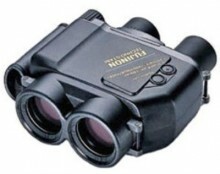 It`s the world`s only high power image stabilizing binocular that is 100% waterproof. And it works as well if you`re on a sailboat, power cruiser or sportfisherman, large commercial vessel, plane, car, helicopter, truck, train, or RV. Only the TECHNOSTABI helps you deal with individual and compound external forces: cyclical and irregular motion, vibration, bumps, sea or air turbulence, tides and currents, winds, acceleration, deceleration, turns, changes in altitude and attitude, wind shifts, road conditions, and anything else that can make binocular use near impossible. Like the world`s first internally stabilized binocular, Fujinon`s STABISCOPE, the TECHNO-STABI utilizes a gimbaled frame with erecting prisms, but replaces a single, heavy, costly and power-hungry high-speed gyro motor with two advanced, direct-drive motors (much like those found in CID players and disk drives). With no waiting period for the gyro to get "up to speed," image stability is virtually instant and constant. Each direct drive motor responds to its own piezo-vibration sensor and gyro position sensor, - one set of sensors for for horizontal motion (AZIMUTH) and one for the vertical ELEVATION). As the sensors detect any vibration or motion, the CPU processes the incoming signals and initiates the direct drive motor response required to make the necessary corrections. The result is smooth and seamless, allowing rapid scanning both horizontally and vertically, without lags. And the individual direct drive motors, operating only when needed, deliver greater operating efficiency, reduced power consumption, and longer operating life. Speaking of power, if you happen to have the TECHNOSTABI powered up, but do not use it for one minute, it shuts itself off automatically. Click the button below to add the Fujinon Techno-Stabi 14x40 TS1440 w/Carrying Case to your wish list.